- If the vehicle is heavily laden, check the tire pressures and correct them if necessary. - When parking your vehicle, make sure that the tires do not get deformed by the curb or other obstacles. If it is necessary to drive over curbs, speed humps or similar elevations, try to do so slowly and at an obtuse angle. Otherwise, the tires, particularly the sidewalls, can get damaged. - Regularly check the wheels and tires of your vehicle for damage (e.g. cuts, punctures, tears, bulges on tires and deformation or cracks or severe corrosion on wheels) at least once a month, as well as after driving off-road or on rough roads. Damaged wheels can cause a loss of tire pressure. - Regularly check the tire tread depth and the condition of the tread across the whole width of the tire. If necessary, turn the front wheels to full lock in order to inspect the inner side of the tire surface. - All wheels must have a valve cap to protect the valve against dirt and moisture. Do not mount anything onto the valve (such as tire pressure monitoring systems) other than the standard valve cap or other valve caps approved by Mercedes-Benz for your vehicle. - Regularly check the pressure of all the tires including the emergency spare wheel or the spare wheel, particularly prior to long trips, and correct the pressure as necessary. Although the applicable federal motor vehicle safety laws consider a tire to be worn when the tread wear indicators (TWI) become visible at approximately 1/16 in (1.6 mm), we recommend that you do not allow your tires to wear down to that level. As tread depth approaches 1/8 in (3 mm), the adhesion properties on a wet road are sharply reduced. Do not use tires that are excessively worn as the tire traction on wet road surfaces decreases significantly when the tread depth is less than 1/8 inch (3 mm). 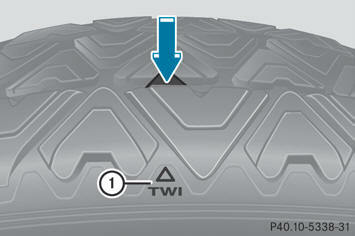 Tread wear indicators (TWI) are required by law. Six indicators are positioned on the tire tread. They become visible as soon as a tread depth of approximately 1/16 inch (1.6 mm) has been reached. If this is the case, the tire is so worn that it must be replaced. The recommended tread depth for summer tires is at least 1/8 inch (3 mm). The recommended tread depth for winter tires is at least 1/6 inch (4 mm). Bar marking 1 for tread wear is integrated into the tire tread. - Only mount tires and wheels of the same type and make. - Only mount tires of the correct size onto the wheels. - After mounting new tires, run them in at moderate speeds for the first 60 miles (100 km) as they only reach their full performance after this distance. - Do not use tires that are excessively worn as the tire traction on wet road surfaces decreases significantly when the tread depth is less than 1/8 inch (3 mm). - Replace the tires after six years at the latest, regardless of wear. This also applies to the spare wheel/emergency spare wheel. MOExtended tires may be used only in conjunction with the activated tire pressure loss warning system or the activated tire pressure monitoring system and only on wheels specifically tested by Mercedes-Benz. You will find notes on driving with MOExtended tires in the "Breakdown assistance" section.